He's a pioneering designer, a master couturier, a style icon. Now he's working with Gucci. Dapper Dan says he's just getting started. 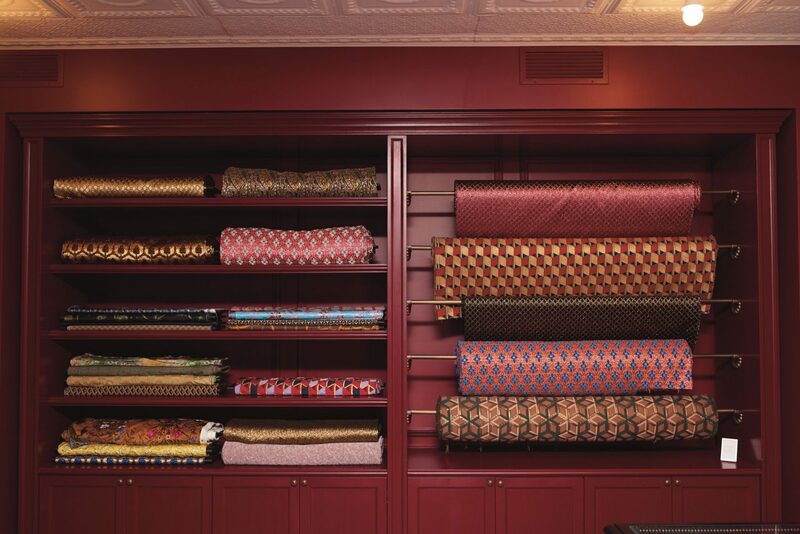 It’s a Thursday afternoon at Dapper Dan’s atelier—a three-story operation that opened in January at an undisclosed brownstone in Harlem—and the normally by-appointment-only front room nears capacity. A photography crew navigates the spaces between deep-red walls, velvet room dividers, and a walnut fireplace, setting a shot for their subject. Nearby, Dapper Dan’s son and manager takes a phone call along a wall of ornate fabrics, spooled five-high, while an assistant nearly knocks over a green-marble side table stacked with Gagosian catalogs and Jamel Shabazz’s hip-hop street style bible, Back in the Days. Accustomed to the bustle, Dap breezes through, past a framed photograph of himself outside of the Apollo, taken by Ari Marcopoulos. He’s tall, thin, and strikingly—for a man who one could reasonably imagine sleeping in a well-tailored waistcoat and cordovan monk straps—underdressed, in a semi-blank canvas of white shorts, T-shirt, and red-and-blue patterned Gucci loafers. He bends around a backdrop to study the setup and compliments the progress: “Oh! You just need a body now.” Taking his cue, Dap disappears into a heavily draped changing room. He reemerges minutes later wearing a midnight-blue dinner jacket and ankle-cropped trousers—the fashion icon who has called himself “the first hustler-slash-designer,” in all his glory. There’s an exquisitely patterned cravat tucked behind the bib of his pique front shirt; a matching handkerchief billows from his breast pocket. He has on the kind of shoes most men wouldn’t dare eye in a shop window, much less have the confidence to actually purchase, and sunglasses with his own name spelled down the arms in Swarovski crystals. He stares into the mirror, tugs his lapels. The fit is impeccable. Metamorphosis has always been a key theme for Dap, but especially these days, a point made clear in the irony of his new arrangement: a collaboration with Gucci to produce sanctioned recreations of his classic designs. The very same designs that Gucci—alongside other luxury brands, a future Supreme Court justice, and anti-counterfeiting investigators—tried so desperately to eradicate three decades earlier. Raised in the nearby housing projects at 127th Street and Lenox Avenue, Dapper Dan (born Daniel Day) and his six siblings were taught to be proud despite their poverty, and steadfast in the face of temptation. Dap’s god-fearing upbringing was soon challenged by the appeal of the streets, the financial viability of gambling, and, above all, the desire to look damn good—even if that meant coordinated smash-and-grab jobs with the other teens from the neighborhood, punctuated by screams of “Ali Baba! Ali Baba!” (a reference to the scrum of 40 thieves, give or take). He began writing for a newspaper called 40 Acres and a Mule (“This was way before Spike Lee,” he’s quick to point out) and, through the New York Urban League, toured Africa for 10 weeks—Ghana, Nigeria, Kenya, Uganda, Ethiopia, Egypt, and Tanzania—to “find [his] own truth.” The journey proved formative. 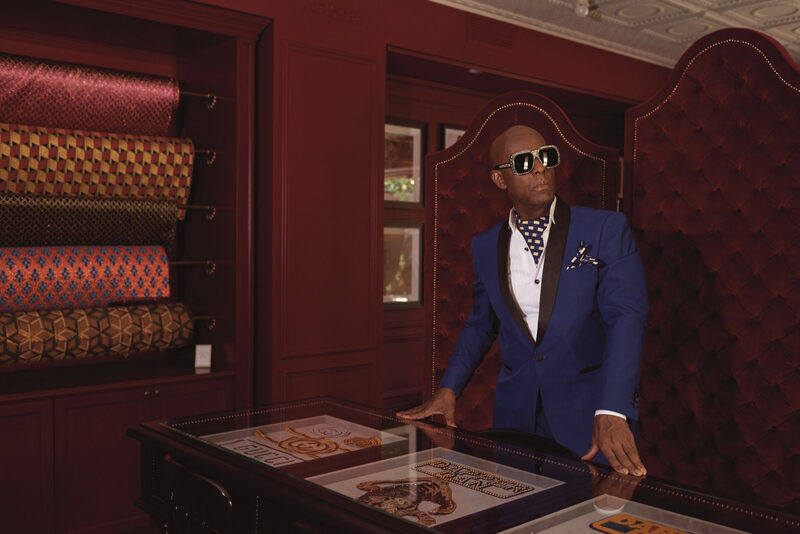 Not only as a foray into melding European design with African fabrics—Dap says he traded every article of clothing in his suitcase, right down to the socks, and had a local tailor make new ones— but also as a cosmic push in the direction of what would become his life’s work. In 1982, on 125th Street in Harlem, he opened Dapper Dan’s Boutique. Initially a fur-focused haberdashery, the business soon shifted to full-service production, and he hired, among others, African immigrants to sew his creations. One of the shop’s signature moves was stitching designer leather trim into fur coats, a costly process that involved buying out garment bags from high-end shops like Gucci. He quickly realized that, if his clientele were enamored by subtle attempts at unlicensed branding, they’d go nuts for one-offs with brasher head-to-toe patterns, so long as the quality held up. The distinction was subtle but profound. Years before major fashion labels caught on, Dap grasped the full power of designer iconography—that, when applied with a curatorial eye and craftsmanship befitting the brand (and the couturiers at Dapper Dan’s Boutique were nothing if not masters of their craft), it could be leveraged. It could mean status, resistance, irreverence. And that could make his writing more aspirational, not dilute the appeal. Plus, the luxury was real, even if the designer logos weren’t—they were leather-screened on the premises, usually at odd hours to keep customers from being overwhelmed by the noxious fumes—and Dapper Dan’s reputation only grew. During the 1980s, he established himself as a sartorial pirate, a knock-up artisan of sorts. Crucially, he became the purveyor of hip-hop chic. He made custom garments for KRS-One, Big Daddy Kane, and Jam Master Jay. In appreciation, he got name-checked by Kool G Rap and DJ Polo, and was immortalized on the cover of Eric B. & Rakim’s seminal album Paid in Full, where the duo appears decked out in Dap’s wares. His work was also celebrated by honest-to-god gangsters, like crack kingpins Alpo Martinez and Azie Faison. “My best customers were the ones with power in the subculture,” Dap offers plainly. Still, even as he helped sew the landscape for the first wave of logomania, it would take decades for the fashion industry to fully align with the nuanced flash of his clothing. High- profile clientele, like Mike Tyson and Bobby Brown, made Dap a target for corporate lawyers, including Sonia Sotomayor, who represented Fendi at the time; anti-counterfeit task forces made no distinction between a bespoke leather coat, its design lavished in time and personality, and the glut of cheap imitation handbags flowing into New York’s ports. 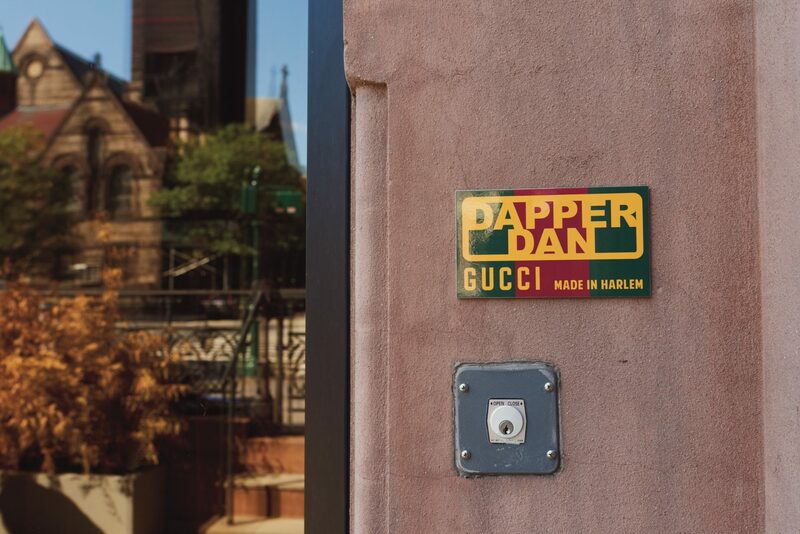 Dapper Dan’s was repeatedly raided, his creations and materials seized. In 1992, he closed up shop for good and went, in his words, “underground.” The spirit of his work, however, never went away. On the second floor of the atelier—a high-ceilinged, yellow-walled parlor for VIP customers like Jay-Z and Beyoncé—Dap sinks into a plush velvet couch to contemplate his second act, an unlikely inversion of the first. Last May, at a cruise collection show in Florence, Gucci creative director Alessandro Michele showed a puff-sleeve mink jacket; it was an eye-catching number, and eerily reminiscent of a knock-up Louis Vuitton design Dap had made for Diane Dixon, the Olympic sprinter, in 1989. Side-by-side photos spread across social media. The similarities set off debates, both within the fashion industry and the design community at large, about appropriation and proper credit. But instead of trying to squelch the affiliation, Gucci leaned into it. The fashion label, which was recently valued at $14.9 billion, took to Instagram, where it confirmed that the jacket was, indeed, “an homage to Dapper Dan.” Michele reached out to the legendary outlaw tailor, and a new partnership was announced soon after. Gucci would provide the materials and help resurrect the space in Harlem, and Dap would do his thing. “This is the first time in my life I can be creative above-ground, without worrying about big brands getting upset,” he says, smiling. The first commercial fruits of the collaboration arrived this July, in the form of a new capsule collection, displayed prominently at Gucci’s flagship boutique and online. It features a mix of ready-to-wear pieces and accessories, “Guccified versions of the original Dapper Dan aesthetic,” including tracksuits, gold medallions, high-tops, backpacks, and belt bags. They’re embellished with sweeping monogram patterns, surreal appliqué embroideries, swathes of extravagant fabrics, and, yes, plenty of screenprinted leather. In other words, what Dap’s always done, in a way he’s never done it before. Meanwhile, the revived Harlem atelier’s made-to-measure operation will continue indefinitely, also with Gucci’s corporate blessings. But it’s only the opening line in a larger story he wants to tell. There’s a memoir due out in 2019 from Random House, and Sony has already bought the film rights. When did you first realize that clothes were important to you? I think I might have been in third grade, so 7 or 8 years old. My mother hit the number. You know what that means? Like the lotto. And she bought me some shoes. One of my mother’s friends, who lived in a better multiple dwelling than we did, said, “Lily Day must have hit the number!” It bothered me because it was true. From that point on, I thought, “I’m gonna get me some clothes.” Because that was like a knife. How did growing up in Harlem influence your sense of style? You didn’t come out on the street unless you was dressed. That’s the kind of climate it was. If you go to 116th Street right now, you see people lined up by the church with carts, waiting to get food. Back then it was the same. But people had so much pride and dignity that they would cover the wagon. Nobody wanted anybody to know they were getting government cheese and peanut butter and Spam. And the whole neighborhood was first migration, so it was a different sense of pride. That set the stage for how you carried yourself. So how does a young boy in poverty go about stepping up his game? We all had holes in our shoes, so we’d put newspaper in them to keep our feet from being on the ground, until we got more innovative and started using linoleum. My shoes had worn out so bad that there was nothing to keep the linoleum in, so I said, “My feet is killing me!” My eldest brother said, “Don’t worry. Come with me.” We walked to the Goodwill, and he said, “See any shoes you like?” I pointed a pair out and tried them on. He said, “How they feel?” I said, “Feeling good.” He said, “Okay, take your [old] shoes and put them on the rack. Let’s go.” I never forgot them shoes—classic rust, split-toe with the tassels. What inspired you to stop hustling and tour Africa? Two forces were pulling on me, ’cause I grew up in the Holy Ghost Church, and that never left us. And, obviously, this force to just survive is pulling me back. But when I saw what was happening in my community, I said, “I can’t get trapped in this.” I read a book of Malcolm X’s speeches. He said, “If you want to understand the flower, study the seed.” That always stayed with me. I had to remove myself from the hypocrisy of the church, the hypocrisy of the Nation of Islam, the hypocrisy of all these radical things that I saw. I said, “You know what? I’m going to find my own truth.” So I went to Africa. You also found fashion inspiration on your trip. When I returned, I looked for something to do. My passion was clothes, so I decided to learn everything I could about them. I started reading books, going to trade shows and factories. Never runway shows, because I was nobody. My friend had a store on 125th Street, and with his business card, I could register for shows. I taught myself about print, textiles, the latest equipment. That’s how I was able to do all this stuff—the stuff that’s made me a solid partner to my new great friends at Gucci [laughs]. I was fascinated when I visited Florence—today, they’re doing everything I was doing thirty years ago. They’re only doing one thing in Florence that I didn’t do thirty years ago: 3-D printing. As soon as I get a break, that’s where I’ll be. You’ll find me up in some little workshop, playing with a 3-D printer. Your vision for Dapper Dan’s Boutique crystallized quickly. But you were constantly starting over after being raided and sued for copyright infringement. Time and time again. You know that Clint Eastwood movie [A Fistful of Dollars]? When the guy shoots the metal [plate he’s wearing] and he just keeps coming? I tempered myself like that, to the point, well, they knock me down, I’m going to get up. I’m not going down. I mean, when you grow up swimming in the Harlem River, holes in your shoes—what they call knocking you down—is nothing. —that what I was doing was wrong? No, that you’d be a target from day one. That the lawyers would come for you. No. But I looked at it as a civil rights issue. “Y’all won’t let me in? Okay. The hell with all of you. If I can’t come up the staircase, I’ll build my own.” People act like it’s unusual, but look at [black] music. We have to innovate. The thing about people of color in America is that it hasn’t been that long—a hundred-fifty-something years of liberation. You’re looking at people who were completely denied of their heritage. When that happens, to instill dignity, you have to have a powerful cultural platform. Otherwise you’re not going to grow. I took that and I translated it into fashion. And that’s what I do today. The boutique became a pop-cultural epicenter for athletes and hip-hop artists. Did you raise their profiles, or did they raise yours, or both? Well, the celebrities you’re referring to didn’t raise my profile. I built them. And they’ll all tell you that. Otherwise, I’ll pull out some of my IOU slips, like LL Cool J with that $2,200 he still owes me. But it was really the gangsters—actual gangsters. They all came to me. Everyone who came afterward was buying into that. Today it’s the other way around: The rappers all have more money than the gangsters. The structure’s there. I’m having fun. But I haven’t played in the yard yet. You know what I’m saying? When I get a chance to free myself up, when the memoirs are out, the movie…. I’m looking forward to the day when I can really explore, for myself, to see exactly who I am and what I can do. 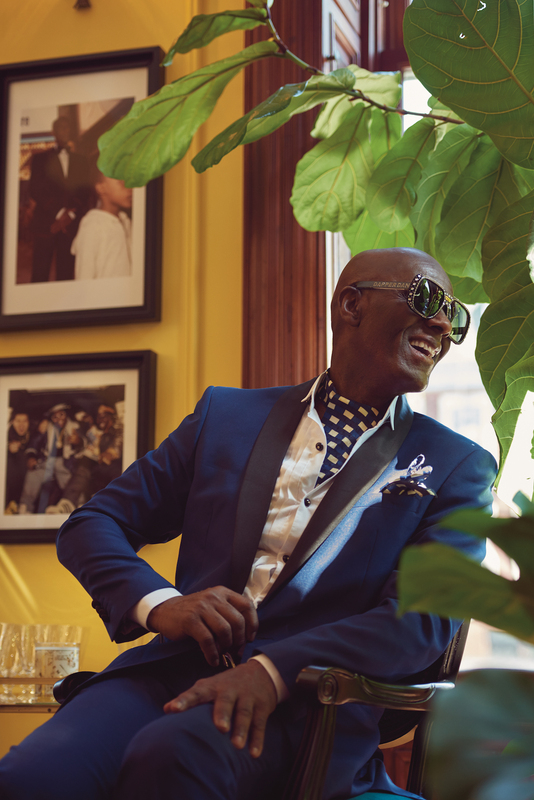 The 2018 Fashion Issue of Surface magazine, featuring Dapper Dan on the cover, is now available. Buy here. Surface is one of the fist magazines to offer subscriptions purchases using Apple Pay. Subscribe here.